* Beautiful Wood and Ceramic floors. 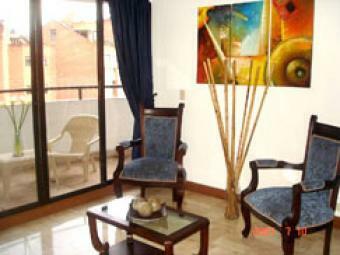 * Large Private Balcony with Beautiful view of Medellin. * Living Room with new Furniture, Sofa Bed. * Bedroom with new Queen Size Bed & Night stands. * Social and private bathrooms. * 21 inch Flat screen TV with cable. * New Computer in the apartment with Free internet connection. * Free calls to the USA and Canada from our office. * Free Calls to the USA and Canada. * Kitchen with refrigerator and all Utensils.